HOUSTON (Reuters) - A raging fire at a petrochemical storage terminal near Houston spread to two more massive tanks after firefighting water pumps stopped working for six hours, the company said on Tuesday. 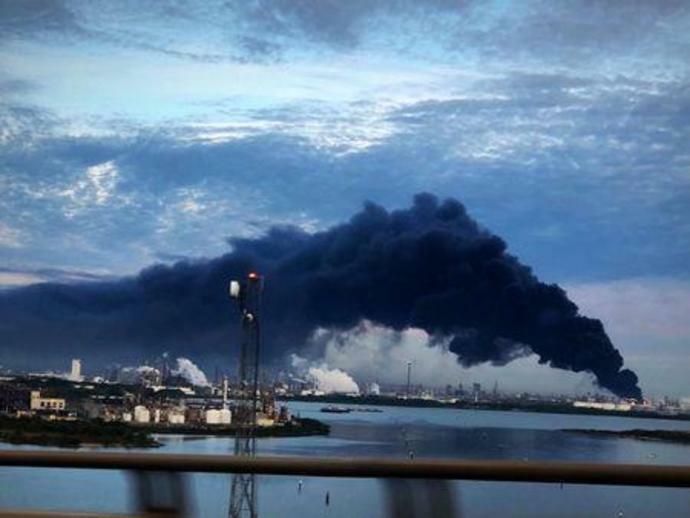 The blaze at Intercontinental Terminals Co (ITC) in Deer Park, Texas, has been burning since Sunday when a leaking tank containing volatile naphtha ignited and quickly spread to other nearby tanks, the company said. The fire has spewed thick, acrid smoke, which is visible from dozens of miles away. The steel containers hold up to 160,000 barrels of liquid products used to boost gasoline octane, make solvents and plastics, according to the company's website. Some of the chemicals have washed into the adjacent Houston Ship Channel that links the Gulf of Mexico to Houston, the nation's busiest petrochemical port, a spokesman said. Pumps on two boats feeding water to firefighters malfunctioned for about six hours on Monday evening, ITC spokesman Dale Samuelsen said. As a result, two more tanks, one empty and the other containing toluene, a volatile liquid used to make nail polish remover and paint thinner, caught fire. ITC, which is owned by Japan's Mitsui & Co, said on Tuesday it is bringing in a 15-person crew experienced in battling tank-farm fires, additional high-pressure pumps and suppressant foam to battle the inferno. "We have been up to this point in defensive mode" trying to contain the fire, said Samuelsen. "Because of the expertise these guys bring, the expectation is we'll be able to go into offensive mode" later in the day. Samuelsen said the burning tanks are within a six-foot tall earthen berm that is collecting water and chemicals leaking from the tanks. Firefighters are pumping 10,000 to 20,000 gallons of water and foam a minute onto the tanks. Some chemicals and water have escaped the site and flowed into a nearby waterway and into the ship channel, he said. ITC has set up containment booms to limit the liquids from spreading and to capture the chemicals. State and federal regulators have said they are monitoring the site. Samuelsen said he had no new timetable for when the blaze will be extinguished. On Monday, ITC had said the fire could burn until Wednesday. Air-emission readings showed pollution from the chemical fire has not exceeded acceptable levels at ground level measurements, Samuelsen said. The Texas Commission on Environmental Quality, a state regulator, installed additional air monitors near the site, but had no updates early Tuesday, a spokesman said. Ships continued to move through the 50-mile-long channel, which is part of the Port of Houston linking refineries and chemical plants in Houston and Texas City, with the Gulf of Mexico.